Irene (born1896), Cynthia (born 1898) and Alexandra (born 1904) were the three daughters of Lord Curzon, Viceroy of India 1898-1905 and probably the grandest and most self-confident Imperial servant Britain ever possessed. After the death of his fabulously rich American wife, Curzon embarked on a long love affair with the novelist Elinor Glyn, dropping her to marry his rich and beautiful second wife. His determination to control every aspect of his daughters’ lives – including the money that was rightfully theirs – led them one by one into revolt against him. The three sisters were at the very heart of the fast and glittering world of the Twenties and Thirties. Irene, intensely musical and a keen foxhunter, had love affairs among the glamorous Melton Mowbray hunting set. Cynthis (‘Cimmie’) married Sir Oswald Mosley,joining him first in the Labour Party,where she became a popular and successful M.P., before following him into fascism. Alexandra (‘Baba’), the youngest and most beautiful, married the Prince of Wales’s best friend, Fruity Metcalfe. Within a month of her death from peritonitis in 1933, her younger sister Baba had flung herself into a long and passionate affair with Mosley; during which she also enjoyed the romantic devotion of the Foreign Secretary, Lord Halifax and a liaison with Count Grandi, Mussolini’s ambassador to London. 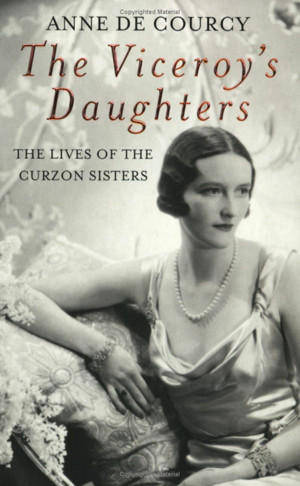 The sisters saw both British fascism and many of the workings of government from the inside as well as having an equally intimate view of the arrival of Wallis Simpson and the subsequent life of the Windsors. The war found them based at ‘the Dorch’, as the Dorchester Hotel was known, with days spent nursing,working in canteens and other war work. Towards the end of their extraordinary lives,both became pillars of the Establishment: Irene was made one of the first four Life Peers (in1958) for her work with youth clubs and Baba’s tireless efforts for the Save the Children Fund was recognised with a C.B.E. Their story,based on unpublished letters and diaries,is a wonderfully revealing portrait of British upper-class life in the first half of the twentieth century. This is a story of fabulous parties, Mediterranean holidays and glittering jewels. It is also an account of a country racked by social deprivation, constitutional crisis and international tension. …Compulsively readable, and immaculately researched, The Viceroy’s Daughters is popular social history at its very best. ...this absorbing and well-written triple biography. An irresistible triple biography of three of the most fascinating 'bright young things' on the glittering British social scene of the 1920s and 1930s. One of them married Oswald Mosley, another an aide to the unspeakable duke of Windsor, and all had romances that made them more or less miserable. You’ll love it. ...a world of glittering house parties, aristocratic immorality and political intrigue in a narrative that reads like a racy novel. A ripping yarn which overturns many preconceptions about these girls' apparently gilded lives.